Appointment of Additional Judges: Some issues…. The Constitution of Bangladesh has been based upon the basic principle of rule of law. The framers of the constitution introduced certain checks and counter checks with the intention that no organ of the State gets absolute powers. The function and power of every organ of the State are subject to certain limitations laid down in the constitution. 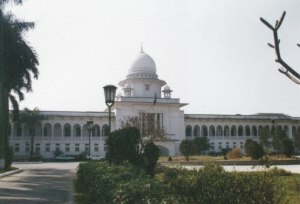 The disputes arising between one organ and another are to be resolved by some independent Tribunal namely judiciary. Even in case of the disputes between individuals, the judiciary maintains the balance between their rights and the society. In this way it has been the balancing the wheel of our Constitution. The quality of excellence of the government is determined on the basis of the efficiency of its judicial system. This judicial function can only performed by an authoritative, independent and impartial judiciary. Justice Bhagwati in one of his judgement observed "The principle of independence of the judiciary is not an abstract conception but a living faith which must derive its inspiration from the constitutional charter and its nourishment and sustenance from the constitutional values." Independence of judiciary in a country like ours is solely depends on a legal culture to be particularly borne in mind by the political community who run executive organ of the state. The legal community must not confuse and mix up independence of judiciary and separation of judiciary together. These are, of course complementary to each other but one can be established except the other and without the separation of judiciary there can be independence of judiciary. In our constitutional scheme there are certain things which these days are considered as threat to independence of judiciary and amongst other things, the appointment of Additional Judges in the Supreme Court is a kind of threat to independence of judiciary to people's perception at large. We all know that article 98 of our constitution has empowered the President to appoint additional Judges and for a number of reasons the practice of appointment of Additional Judges in the Supreme Court needs a serious consideration. Appointment of a judge for such a short duration appears to be peculiar in our part of the world. Such practice is not prevailing in the United Kingdom. Even in India they do not have judges either in the sub-ordinate judiciary or in the Supreme Court whose tenure is so short. We do have sub-ordinate courts in the lower judiciary but they are manned by judges belonging to regular judicial service, which is one of the two constitutional service and their tenure is same as others in the service of the Republic. To my little understanding there are certain drawbacks in the truest sense in continuing the existing system of appointing Additional Judges in the Supreme Court of Bangladesh. I would like to highlight some of them here to substantiate my way of thinking about the matter. Firstly, an Additional Judge would not be in a position to perform his duties as independently as a permanent judge, on account of the fact that an Additional Judge is subject to fresh test of fitness and suitability, physical, intellectual and moral. The conduct of an Additional Judge would remain subject to scrutiny by the high dignitaries in connection with his reappointment or appointment afresh when his tenure specified under article 98 in just to expire. It is obvious that he would not be in a position to deal with the matters placed before him without fear of incurring the displeasure of any one of them. Very often the order passed by an Additional Judge against the State or the Government, who are the biggest litigants in every civil courts are sure to displease the policy makers of the Government in one way or the other. There is no doubt that an Additional Judge takes the oath of office to deal with the matters without fear or favour, and affection or ill will. But after all he, too is a human being. It was due to this reason only the constitutions of many democratic countries did not lay down any provision for appointing Additional Judges. The author is a joint district judge.